How to Eat a Pomegranate and Enjoy It! Here Is How to Eat a Pomegranate and Enjoy It! 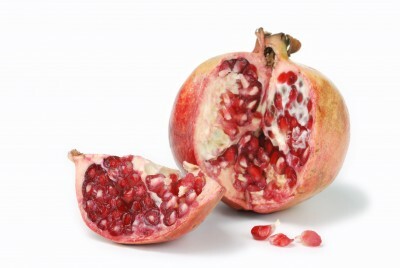 We want you to learn how to eat a pomegranate and enjoy it! It’s really quite simple once you get the hang of the steps. Admittedly, eating a pomegranate is not like eating an apple or an orange…there is a bit of effort involved on your part to get to the delicious seeds inside the fruit. However, once you learn how to eat a pomegranate and discover how versatile and yummy this fruit is, you’ll do it over and over again. Let’s be frank – pomegranates are messy. The juice will stain your clothing and even your counters if not handled properly. With that said, before taking these steps, cover yourself with a bib (a really big one), an apron, or other covering of your choice. Protect your countertop or table as well. Of course, eating them outside would work too. Once you’ve taken these steps, it’s time to learn how to eat a pomegranate! You’ll need the pomegranate, a timer, a colander, slotted spoon or sieve, a cutting board, a sharp knife, and a bowl with cold water. Gather these items and place them on your covered countertop or table. First, cut the crown off of the pomegranate. The crown is the “flowery” looking part of the fruit. Next, use your knife to score the fruit into sections. Don’t cut the fruit all the way through! Think of it as “slices” into the fruit. Make all your scores (cuts) toward the center of the pomegranate. Place the entire fruit, upside down, into the bowl of cold water. Set the timer and allow the fruit to soak in the water for a minimum of 5 minutes, but possibly up to 10 minutes. After the 10 minutes, break the fruit open while it is still immersed in the water. Break apart “slices” of the fruit and remove the seeds from the white membrane. You’ll notice that the membrane, or pithy part of the fruit, will float in the water. Allow the seeds to naturally sink to the bottom of the bowl. This separates the rind and the seeds pretty easily. Skim the rind that’s floating on top of the water with a slotted spoon or sieve and toss. Pour what is remaining in the bowl through a colander. The seeds will be caught in the colander. Pat the seeds dry with a towel or paper towel. Now the seeds are ready to eat! Or you can store the seeds in the refrigerator for up to two days, as long as they’re stored in an airtight container. Now you know how to eat a pomegranate! It may seem like a daunting task at first, but believe us when we say that the bit of effort is well worth tasting the tangy, delicious seeds inside. The seeds of the pomegranate are bursting with healthy vitamins, nutrients, and antioxidants too, so you’re not only enjoying the pleasure of the taste, but also helping your body fight disease at the same time. Since you’re now an “expert”, you can teach someone else how to eat a pomegranate and enjoy it! 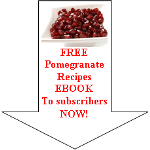 Read enough about how to eat a pomegranate and want to discover more about this healthy fruit?